'Makar' is the Scots word for the author of a literary work, and particularly for a poet or bard. 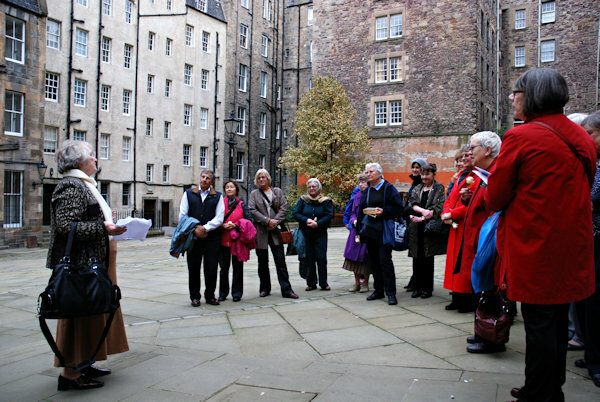 Situated in the heart of the Old Town not far from where Sybilla's house would have been situated, the Writers' Museum in Lady Stair's Close can be reached either from the Lawnmarket or from the Mound. The Makars' Court is the courtyard surrounding it and was conceived as a national literary monument. 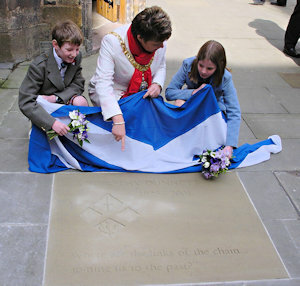 It contains many commemorative stones set into the walls and paving slabs celebrating Scotland's rich history of great writers. 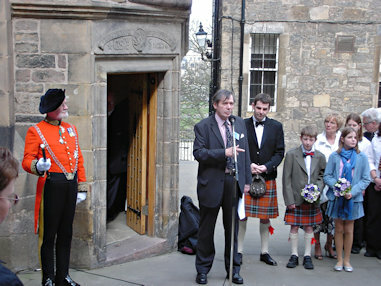 There are stones there for such luminaries as Sir Walter Scott, Geoge Mackay Brown, Sir David Lyndsay, Robert Fergusson, and James Hogg, amongst many others; each containing a quote from the author concerned. 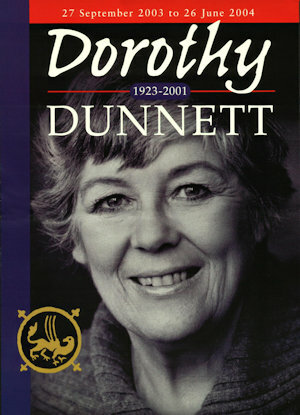 A few years ago the Dorothy Dunnett Society organised and funded a stone for Dorothy so she could take her rightful place in this august company and due largely to the tireless efforts of Betty Cooper who gained the necessary permissions, organised the design, the poll for the selection of the quotation used, and the carving and laying of the stone, this was successfully achieved and the stone was unveiled by Dorothy's grandchildren, Bella and Hal, at a ceremony in the company of the Lord Provost of Edinburgh in 2006. 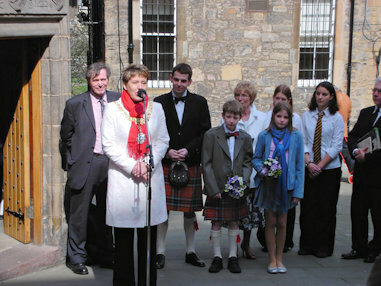 More photos of the stone laying can be found on the Makars' Court Stone Laying Ceremony page. 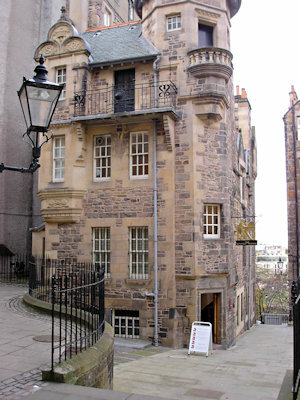 The museum is an interesting building dating originally from 1622 and known as Lady Stair's House. Extensively restored by Lord Roseberry in 1897, it has for many years housed full time exhibitions about three of Scotland's most distinguished writers - Robert Burns, Sir Walter Scott, and Robert Louis Stevenson, with many artefacts and pictures which will fascinate devotees of literature. Alongside these there are other temporary displays and it is this space that an exhibition of material relating to Dorothy is periodically shown. 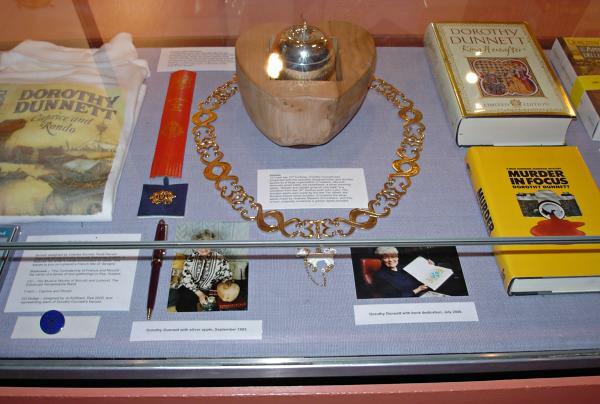 First shown in Sept 2003 - June 2004, the exhibition was put together with the help of Elspeth Morrison and features some of the objects that were associated with Dorothy and presented to her. These include one of her typewriters, the gold, silver and wood Warming Apple that was gifted to her, and the Unicorn Collar which she received to commemorate her work on the history of Anselm Adorne. 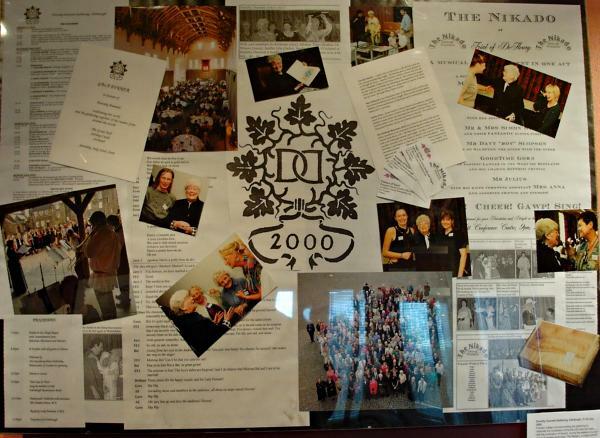 These objects were donated to the museum by the family and joined various photos, reviews, pamphlets and material from the 2000 Gathering.